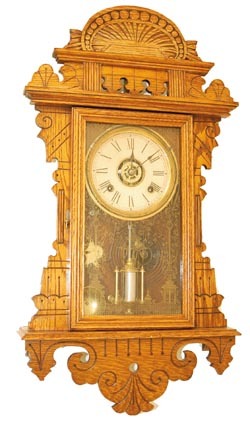 Ansonia Clock Co. oak hanging kitchen, made expressly for the American Wringer Co. The label designates it the "Eclipse" model, 8 day, half hour strike. Two full labels on the back now covered with plastic to protect them. The American Wringer Co. was a New York company that sold laundry equipment. It is generally believed they gave away a clock as a premium for buying their equipment. This is an 8 day, strike and alarm model, clean and refinished long ago. I would speculate that it is all original with the possible exception of the paper dial. All the wood is solid with no breaks or repairs. Fancy one barrel pendulum, bell, and alarm, dial ring, all clean and bright.